Born: 1880, St. Nicholas, Ipswich. Died: 22nd March 1915; age 34; KiA – shot in the head by a sniper. First attested to the regular army: 17th January 1900 – using the newly introduced form AF.B.111. Aged 20 years – had already served as an apprentice for 7 years. Discharged at his own request – served 8 months. Date of Entry Therein: 26th January 1915 – France. Winter Operations 1914-15, The First Attack on Bellewaarde, The Actions of Hooge & The Second Attack on Bellewaarde. Medals Awarded: Queen’s South Africa Medal + 3 Claps – Cape Colony, Orange Free State & Transvaal. Victory, British War & 1915 Star. Relatives Notified & Address: Son of the late Hugh & Maria Bothwell, of Ipswich; husband of Georgina Bothwell, of 135, Handford Road, Ipswich. 1881 16, Peel Street, Ipswich. Hugh was a year old and living with his parents. Hugh Bothwell, 25, a Salesman, born County Down, Ireland. Marsh Maria Bothwell (nee Barber), 25, born Witnesham, Suffolk. 1891 2, Soane Street, Ipswich. Hugh was 11 years old and living with his parents & siblings. Hugh, 36, a Salesman – Mineral Water. Maria, 36, a Shop Woman – General Shop – own account. Lilian Alice Bothwell, 9, born Ipswich. James Bothwell, 8, born Ipswich. Amos Bothwell, 7, born Ipswich. Beatrice Annie Bothwell, 5, born Ipswich. Claude Bothwell, 3, born Ipswich. 1901 14, Silent Street, Ipswich. Hugh was 21 years old, a Carpenter. He was living with his widowed mother & siblings. Maria, 44, a Boarding House Keeper. Lilian, 19, an Assistant Teacher – Elementary School. James, 18, a Plumber’s Apprentice. Amos, 17, a Coach Builder’s Apprentice. Beatrice, 15, a Pupil Teacher. May 17th 1901 Suffolk Chronicle & Mercury newspaper. 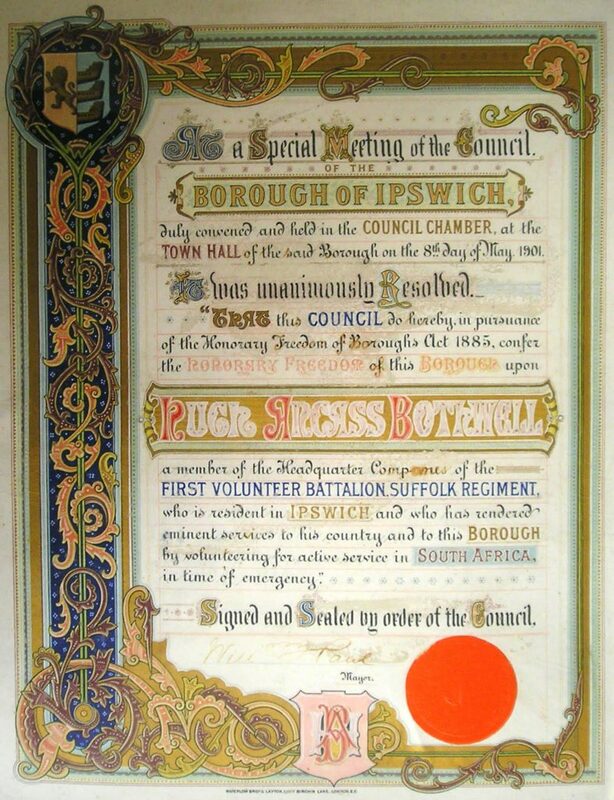 At the meeting of the Ipswich Town Council on Wednesday, the Deputy-Mayor proposed the following resolution:- “That this Council do, in pursuance of the Honorary Freedom of Borough Act, 1883, confer the honorary freedom of this borough upon these members of the Headquarter Companies of the 1st Volunteer Battalion Suffolk Regiment, who are resident in Ipswich, and who have rendered eminent services to their country and this borough by volunteering for active service in South Africa in time of emergency; and that a copy of this resolution suitably engrossed, be signed by the Mayor, and presented to each of the Volunteers specified, namely:- Marshall Duggan, William Jarrold, Charles Wright, John Thomas Pye, John Percy Rogers, Frederick Percy Godbold, William Lambert, George John Norman, Hugh Amass Bothwell, Ernest Charles Chamberlain, Jeffrey Charles Snelling, Charles Slingsby, Edward Thomas Roper, William Frost. Mr. W.T. Pretty, in seconding, remarked that the attitude of the public towards Volunteers had changed a great deal during the last twelve months. The Volunteer forces stood between the public and conscription, and he thought for that reason they were deserving of a certain amount of gratitude. (Hear, hear.) Personally, he intended to look after the returned Volunteers in the matter of employment, should any of them be without work. The Mayor said he had anticipated what would be the decision of the Town Council, and he had taken the liberty to draft and have engrossed a suitable address for presentation to each of these men. (Hear, hear.) He thought the valve of the hon. freedom would be enhanced if the presentation were made promptly and accordingly he had invited these 13 gentleman to dine with him at the Town Hall on Thursday night, and he would take that opportunity of presenting them with the freedoms. (Hear, hear.) As to Mr. Churchman’s suggestion for the placing of a tablet in the Town Hall, no notice had been given of such a proposal, and its consideration might very well be postponed for a month. 1901 Following military service in South Africa, taking part in the Boar War. Hugh was awarded “Freedom of the Borough of Ipswich”. 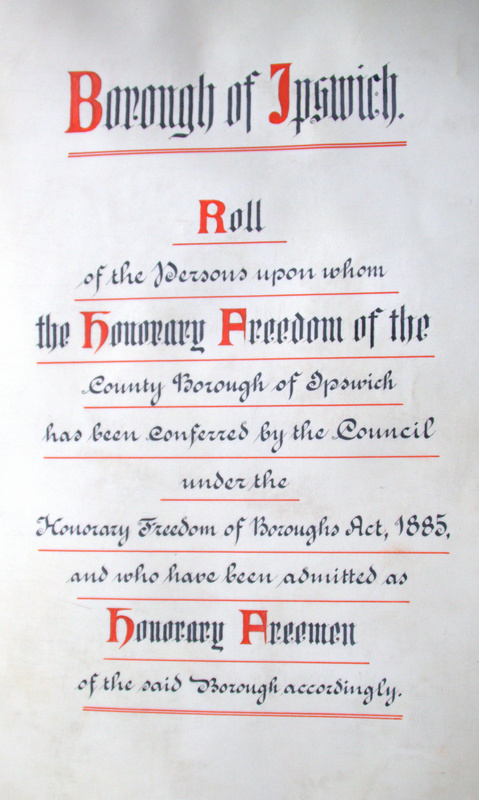 Freedom of the Borough is the highest honour given to an individual. Ipswich had given the honour to Lord Kitchener (High Steward of Ipswich). 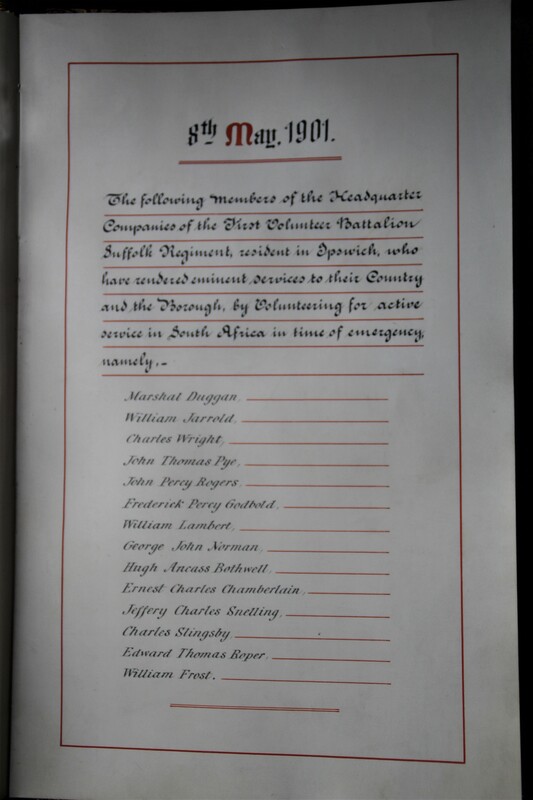 Hugh was honoured along with 13 other Ipswich men for their service to the country. 1911 135, Handford Road, Ipswich. Hugh was 31 years old, an Assistant Superintendent to the Refuge Assurance Company. He was married and Head of the Household. Hugh’s father Hugh Bothwell, died 1901, Ipswich. Vera Annie Bothwell, born October 1902, Ipswich. Edna Kathleen Bothwell, born September 1913, Ipswich. 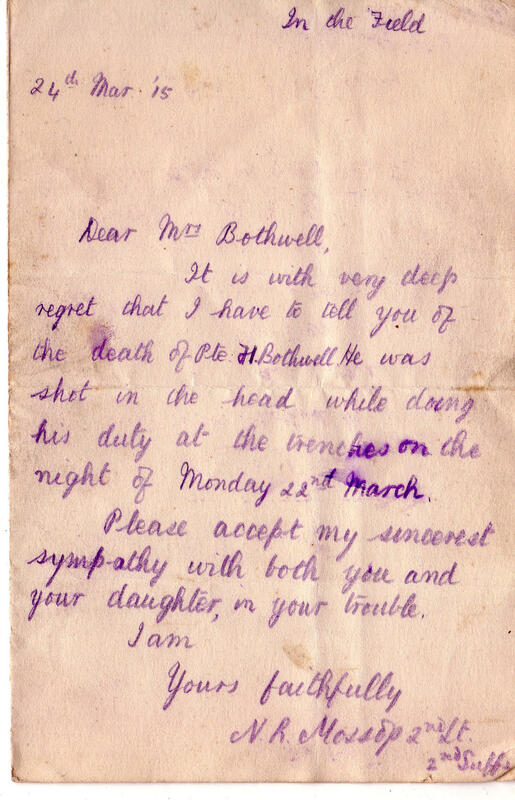 Soldiers’ Effects to Georgina Bothwell – widow. Family account handed down has it that smoking killed my grandfather. He was standing between two other soldiers and lit up a cigarette – a sniper always aims in the centre of a group and he was in the wrong place that night. The story went on that his mates buried him in a temporary grave but as they moved away, the site received a bomb hit. Hugh Green. 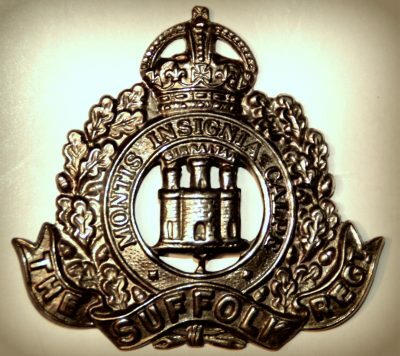 Hugh is also remembered on the war memorial for the Refuge Assurance Company, at Fulshaw Hall, Wilmslow, Cheshire , and at St. Peter’s Church, Ipswich, and on the war memorial for the Presbyterian Church that was formerly on London Road, Ipswich – now kept at Ipswich Museum. Hugh Amass Bothwell – my maternal grandfather – is also mentioned on the Refuge Assurance Company memorial at Fulshaw Hall Wilmslow Cheshire. NB My mother Edna Kathleen Bothwell was born Sept 1913 and not October as stated. 1 Pings/Trackbacks for "HUGH AMASS BOTHWELL"